When framing exterior walls some extra work and skill is required to frame window openings. And it is even more complicated if you need to frame a window opening into an existing wall. 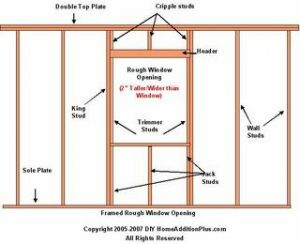 Before tackling a window framing project make sure you obtain the rough opening requirements for the window you plan to install. If you don’t frame the window opening to the window’s rough opening specifications you’ll either not be able to insert the window into the roughed in window frame opening or you won’t have the play in the opening to square and plumb up the window in the opening. This latter issue is particularly insidious and painful, because of the false sense of security. You might have been able to squeeze the window into the rough window frame opening, however you may not realize until much later that the window will not open and close properly, because you weren’t able to square it up adequately. Normally the rough window opening specifications call for the window frame opening to be 2 inches longer and wider than the window itself. This allows for about 1 inch of play all around the window in the window frame opening so that you can square and plumb it up. A carpenter’s level along with shims are used to ensure the window is level and plumb in the opening. Also typically 2x4s or 2x6s are used for residential framing, including the window frame opening. When framing a new wall, and the need arises to frame a window opening, first mark on the top plate and bottom sole plate the location of the window. Make marks on both plates for a king stud and a jack stud to positioned on either side of the window opening. Again, the rough opening between the two jack studs should be the required window rough opening specifications, roughly 2 inches wider than the window itself. Next nail two king studs between the top plate and bottom sole plate of the wall. Then, nail the bottom/inside jack studs to the king studs, again making sure the rough opening between the two jack studs meets the window’s rough opening requirements. Also, make sure the height of the jack studs meets the height requirements, minus 1.5 inches for the window sill plate, for where you want the window to sit in the wall. Now attach a window sill plate to the top of the jack studs. Note that when the window sill plate is nailed into place, the window will now sit on it; at the total height of the bottom sole plate, plus the jack stud, plus the window sill plate. Also note that window sill plate sits on its flat side on top of the jack studs. Nail the window sill plate to the top of the jack studs. Next, install trimmer studs on top of the window sill plate and nail then to the king studs. The height of the trimmer studs should be the rough opening window height specification, or again two inches taller than the actual window itself. Also, install any addition jack studs required between the bottom of the window sill plate and the wall sole plate. A jack stud should be installed on 16 inch centers. Then install a header that rests on top of the trimmer studs. The header is usually comprised of two 2x6s or 2x8s that are sistered together and placed on their edge on top of the trimmer studs. Spacers are commonly used between the two sistered pieces of lumber to obtain the same depth/thickness as the 2×4 or 2×6 framed walls. Next nail the header to the king studs and to the trimmer studs. Lastly, install cripple studs between the window header and top wall plate. A cripple stud should be placed against each king stud, and if necessary additional ones every 16 inches along the top of the window header. Nail the cripple studs to the king studs, header and top wall plate. Typically the center cripple studs are toe nailed into the header and top wall plate. The actual steps for framing in a window opening into an existing wall are the same as in to a new wall. However, demolition has to be done first to the existing exterior wall to make room for the window frame opening, and the actual framing in of a window needs to be stick-built. Stick-built means that instead of framing the wall on the ground and then raising the wall into place, you instead install each and every window frame stud piece by piece into the existing framed wall. The use of a framing nail gun is highly recommend as a lot of toe-nailing is required when stick-building walls. Also, for the demolition phase of the project, first make sure all electrical power to the wall that you are going to demolish is turned off at the main circuit panel. 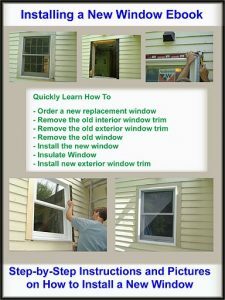 Get this eBook with detailed instructions and pictures on installing a new window. In addition, make sure any plumbing pipes are located and marked on the sheetrock and floor prior to starting the demolition phase of the project. Take care not to cut or damage electrical wires and plumbing pipes. Once you have addressed the electrical and plumbing concerns you can then start the demolition. Start by removing all the sheetrock on the wall, or at least within two feet of each side of where the window is to be framed in. Then remove insulation from the walls. Next, and this is where a reciprocating saw really comes in handy, cut away any vertical stud members between the top wall plate and the bottom sill plate. Note that if you are removing just one or two vertical wall studs you typically have nothing to fear with structurally impacting the integrity of the home. Any more than two vertical wall studs, you may want to check with your local building inspector or an engineer to ensure that you are not compromising the structural integrity of the home and your personal safety. You may need to temporarily add some bracing between the floor and ceiling of the room while you frame the window opening. Once the window opening has been framed in you can then remove the plywood and outside house sheathing to allow the installation of the window. Again, a reciprocating saw is highly useful during this stage.